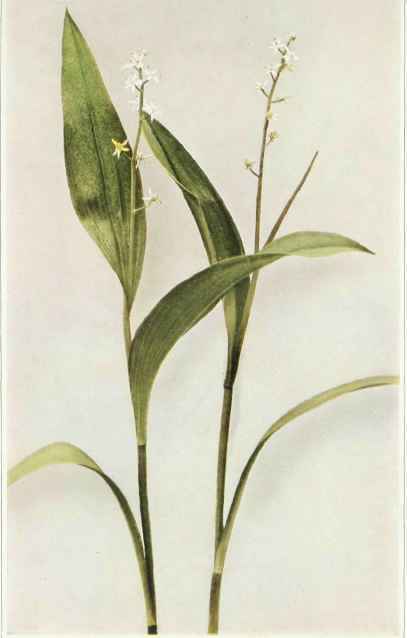 Stem and leaves glabrous from a slender, elongated rootstock, the erect stem 2 to 15 inches high with two to four (usually three) oval, oblong or oblong-lanceolate, sessile leaves 2 to 5 inches long, one-half to 2 inches wide with sheathing bases. Flowers white, few, racemed at the top of the stem; perianth segments oblong or oblong-lanceolate, obtuse, finally somewhat reflexed and longer than the stamens. Fruit a dark-red berry about one-fourth of an inch in diameter. In bogs and wet woods, Newfoundland to British Columbia, south to Connecticut, New Jersey, Pennsylvania and Michigan. Usually abundant in sphagnum under or near spruces and tamaracks, and therefore rare outside the mountainous sections of the State except on the margins of bogs and mossy swamps where the spruce and tamarack abound, as, for instance, Cicero swamp in Onondaga county, and Bergen swamp in Genesee county, as well as numerous other swamps of similar character throughout the State.